My latest book, Summer of Hope, Summer of Dreams, was launched yesterday! (see sidebar to the right to purchase–yes, a self-serving plug, there). The book was just put out for public consumption, but it was a long time in the making–made even longer due to some delays beyond my control. The title is a metaphor for the subject matter of the book, and is a play on a Springsteen song title, Land of Hope and Dreams–also in the book. I grew up in a small steel town in West Virginia and was a rabid Bruce Springsteen fan (still am, of course). A common theme running through almost every one of his songs is that of keeping hope and having faith. Although confronted by what seems like a dead-end–in your hometown, or in your relationships, or in the despair of a post-9/11 America–Springsteen sings about the light at the end of the tunnel. He reasons that in the most trying of times, even though despair threatens to overtake you, keeping your dreams alive, and allowing yourself to hope and have faith that it will be so, will get you through your darkest of days. As it is in Summer of Hope, Summer of Dreams. Becoming an author is a dream come true for me. Sheer blind faith led me to where I am in my writing today (see the connection?). 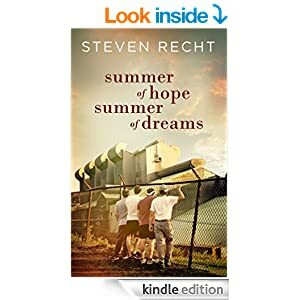 Summer of Hope, Summer of Dreams is my latest baby, and it was a true labor of love. I hope you will read it. I hope you will enjoy it. And to that end, I hope that when you finish it, you will feel that sense, as I have since my childhood, that we can have faith in our dreams coming true. “Once upon a time, in a land far, far away …” Can you imagine opening a new book, turning to the first page, and reading those words? Pick up any how-to book (do they still print those?) or go to any online forum, and you—the aspiring new author—are told to never, ever start a book with: “It was a dark and stormy night…” Or anything of that sort. Why not? Because any literary agent or publisher you are trying to woo won’t get past those first few words. Because, according to them, it’s wrong. Someone needs to explain that to me. Isn’t writing a form of art? Since when was something artistic capable of being “wrong?” Was Monet wrong for breaking from tradition to help create impressionism? Was Picasso wrong for cubism? How about Tolstoy—War and Peace? Orwell? Kerouac? Salinger? Harper Lee? Tom Wolfe? Art is like fashion: in today, out tomorrow. It is subject to the whims of society as it then exists. Van Gogh was hated in Arles and sold one painting during his life. Can you imagine if he listened to his critics and stopped painting his way? He may not have achieved fame and fortune during his lifetime, but his art is society’s treasure. Not every budding author is going to find success or fame. In reality, very few will. But the problem in the literary world—the traditional literary world—is that it is all about the money and not enough about the art. Publishers and the literary agents who feed them their material are the traditional gatekeepers of the art. And they’re failing in that role. Who is to say there isn’t a brilliant author who purposely starts a story “once upon a time,” or “on a dark and stormy night,” who then spins a remarkable tale that is remarkable, in part, because the book began that way? Or is written in a unique voice, or with unique, convention-ignoring grammar? Is that wrong? Or is it art? So, it’s been a while since I’ve written on this blog. Without getting into the gory details, I was too busy dealing with family illnesses to be able to write. Actually, it wasn’t that I was too busy–it was that I couldn’t. I couldn’t write–an act that to me is a joyful exercise–while I was in the midst of some not-so-joyful stuff. My wife kept telling me that I should be writing. She said that writers do their best work when under emotional strain. That their writing under such conditions brings out their best, most pure feelings. That some of the most famous novels were written by authors who were suffering. Well, if that concept applies generally to all writers, I guess I am the exception to the rule. I just couldn’t do it. Not one word, for a long while. Not here, not on my new book project. But, as with all things, time acts as a salve (any fans recall where they read that line before? ), and I feel capable of writing again. Thank goodness! I am busy finishing up the new book, but not quite ready to give any spoilers. Umm, ok, a little spoiler: If you grew up at or around a small steel town in the late 70s, the scenery will be very familiar to you. ‘Nuff said (for now). The most common question I’ve been asked by my readers is how I come up with ideas for my books. The truth is that every day ideas pop into my head for a new book, and they just come from my observations. What I read, what I watch, what I see. A person walking alongside of a country road — there are a whole slew of potential stories there. A story in the paper or on the web might trigger an idea, or even standing in line at a grocery store. I see something or somebody, and nuances frolic through my mind. The ideas are always there. But, to state the obvious, it’s what you do with the ideas that matter. A quirky thing that I do though, is avoid reading any book that I think might involve the same situation or general story line as one I’m working on, because I don’t want to risk that something I’ve read is going to find its way into my writing. 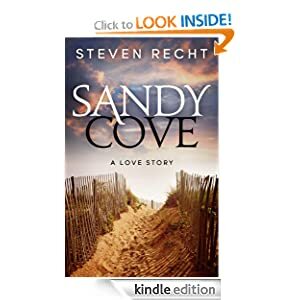 When I was writing Sandy Cove, I was watching television one night and a promotion for Nicholas Sparks’ Nights in Rodanthe came on and I had a mini panic attack. I didn’t even know what that story was about, but I knew that Rodanthe is in the Outer Banks and that Sparks’ books are love stories, which was exactly what I was writing. I did the “lalalalalalala” and put my hands over my ears. Ok, it’s weird, but I wanted to be sure that I didn’t taint my writing with his story line. Writing is such a personal thing. It’s about what’s going on upstairs, in the author’s head, at any given time. I couldn’t write like Stephen King, because I don’t think like Stephen King (Who does?). I hear it in my head and I write it (okay, that is a little freaky–like Stephen King). And it’s revealing bits of yourself to the world, which is in itself a leap of faith that the world won’t think badly of you. It’s fun and scary and exhilarating to know that people are out there in the world, reading your words. But that means you have to write. Which reminds me–back to work! I believe I have allowed myself the appropriate cool-down period before writing this post. Over the past two days, at the hands of United Airlines, I have endured two plane cancellations, as well as a total of six and a half hours of delays, including a brutal five hour stretch during which out of utter boredom I explored every store the Pittsburgh Airport has to offer. But I did manage to resist those pinkish-red bucks the Johnston and Murphy clerk tried so hard to sell me. My ordeal started on Thursday morning, when I had the (dis)pleasure of arriving at my gate to discover that my flight was cancelled. Thanks for the email United–oh wait, you never sent me an email–or any notification–before I parked, went through security and trudged all the way through the airport to the gate. The clerk was nice enough to re-book me on Friday morning, as no flights were available on Thursday. She did this for me without ever laughing at any of my jokes. Am I really not funny at all? Some levity ma’am? Friday morning, bright and early at 3:45 I again left my house for the airport, parked, went through security and trudged to the gate to see that the flight was not cancelled. But it was delayed by fifty minutes. Why? Because the pilot wasn’t there. The rest of the crew was present. No pilot. And just when I thought that maybe the pilot would show in time for me to make my connection, the rest of the crew stood up and walked away, muttering loud enough that the flight was showing as cancelled on United’s app, even though they hadn’t even been called by whomever at United was responsible for telling them. So what was it United? The pilot was hungover? Indisposed? In another city? Sleeping? When I went up to the counter, to the same nice lady from the day before, she looked at me with no recollection of me whatsoever (Seinfeld? Four?) and then told me that other people were ahead of me from a line across the room and refused to help me. Off to another gate where a different United clerk, who had no reason to help me, did, and got me on a USAirways flight–the only available flight I could take to get to my destination–albeit with a four hour wait until that flight was set to leave. To add final insult to injury, once I got on that plane, the pilot came on the intercom and told us that we would have to sit for forty minutes before pushing back because of delays in DC due to a storm. Fortunately, he put on the afterburners once we took off and arrived in time for me to make my connection. So, after my interminable travel day(s), I made it where I needed to go (twelve hours after I left for the airport for the second day), and tonight I get the reward of going to my favorite restaurant in the whole world–The Blue Point in Sandy Cove–I mean, Duck, NC. As Frank Sinatra sang, “Come fly with me, let’s fly, let’s fly away.” Hate to tell you United, I’m not flying your unfriendly skies ever again. One of the rituals of authorhood that has taken me by surprise (and feels really weird) is being asked to sign my readers’ books. I never contemplated that anyone would ever want my signature–except on a check. I suppose then that it was appropriate the other day when I walked into my bank, the same one that I have been going to for years, and was asked by two of the tellers to autograph their copies of Sandy Cove, and also to autograph the back of the Kindle upon which another of the tellers had downloaded the ebook. Friends, co-workers–even relatives–have asked me to autograph their books, and they are serious! Really? I’m the same person today as I was just yesterday, before the tag “author” was attached to my resume. By my estimation, I have signed thousands of documents and letters and miscellaneous things over the years, all the while trying in vain for my signature to look nice and regal instead of the illegible scribble that it is. But this autograph thing is something different, altogether. Whomever has requested that I autograph my book, they have responded to my look of bewilderment with stone cold seriousness. “Do it, author,” they seem to command, the expectation being that I should know what it is I am supposed to do. My face turns red, my head begins to pound. What should I say? Sound witty! Be sincere. DON’T mis-spell anything. And no scratch-outs! Writers’ forums offer thread after thread of how-to’s on how to do book signings, what to write, even what kind of pen to use (for me, a Sharpie). Still, every time I am asked to sign, it comes as a complete shock, and I feel totally unprepared–and undeserving. But maybe I can learn something from my readers, and gain some perspective. So, to Donna and Karen and Judy at the bank, and to all of the others who have requested my signature–thank you for giving me the honor of autographing your books/kindles. And thanks again for reading my book. In the ultimate fall from grace, Lance Armstrong was reduced in stature to the extent of sitting on Oprah Winfrey’s couch this week and confessing to using performance enhancing drugs for virtually his entire career. Shockingly unshocking. Is anyone really surprised that Lance Armstrong doped and doped and doped his way to seven Tour de France titles? How about Barry Bonds hitting 73 home runs? Or Roger Clemens winning seven Cy Young awards? The common thread: they all cheated–themselves and us and their sports. Statistically speaking, history has a foolproof way of validating the human element in sports. Rules changes aside (lowering the pitching mound, handcuffing football defenses, the three point shot), records spanning seventy-five or a hundred years are remarkably resilient. We know that, all things being equal, a baseball player cannot hit more than 61 home runs in a 162 game season, a pitcher cannot win more than 30 games, a football running back cannot run for much more than 2000 yards in a season, and so on in swimming, track and field, cycling, etc. Athletes today are bigger and stronger and faster than they were even twenty years ago, much less 50, 75 or 100 years ago. And yet, records (other than those set by longevity) tend to stand. Hard to believe, but maybe some of the players of yesteryear (Roger Maris, Babe Ruth, Hank Aaron, Jim Brown and Jesse Owens) were better than anyone else, even compared to today’s athletes. But at some point the athletes lost their way. Sports moved from being about sport and became about something very different: money. And when sports became about money–mostly for the leagues and networks and advertisers, but also for the athletes, it began to corrupt everyone involved. Of course, ego has a lot to do with it as well, but athletes have always been about ego. When Alex Rodriguez wasn’t satisfied being considered the best player in his sport, he had to have the highest contract as well ($25 million per year), and then he was so egotistical that neither the ridiculous amount of money nor the statistics he was achieving without doping (if there ever were any) weren’t good enough either. So he doped. And he got caught. And then he admitted it, because he was still so egotistical that he felt he had to rehabilitate his reputation. Just like Lance Armstrong. Some say that Armstrong did so much good, raised so much money for cancer research, that we should give him a break for cheating his way to seven titles. Really? Lance Armstrong purposefully ruined the lives of anyone who he ever imagined posed any threat to exposing him. His ego was so big that he stopped at nothing–lawsuits, threats, financial ruin–to maintain his ruse. And he should be forgiven because he also did good? Well Bernie Madoff gave a lot of money to charity over the years, too. Did anyone ever have to hear Lance Armstrong admit that he doped to really believe that he doped? Or Barry Bonds? Or Roger Clemens? In my opinion, the enormity of the disparity in these athletes’ accomplishments versus the historical record was a tipoff to some fishy stuff going on. Here’s my question, and I hope I’m wrong, but . . . can you look at any of the off-the-charts athletes these days and not think they must be on something? If they are, and they get caught, at least they know that Oprah has a couch they can visit someday.